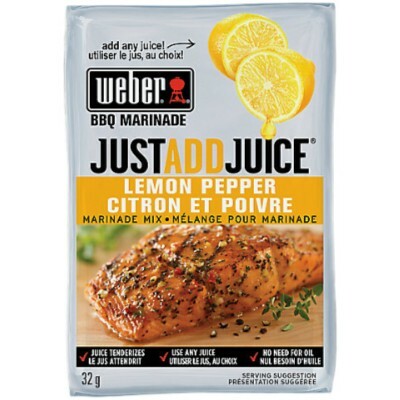 It’s barbecue season, so why not have the best one in town with Weber Lemon Pepper Marinade Mix? Lemon pepper combines the smoky spice of ground black pepper and the citrusy tang of lemon to create a marinade mix that pairs perfectly with chicken, beef, pork, even veggies! Wait are you waiting for? It’s time to spice up your summer! Sugar, salt, black pepper, other spices, garlic, onion, modified food starch, red bell peppers, lemon peel, thickening agent E415, spice extract, color E100ii. Contains GMO. Nutrition facts (for 100g): calories 333Kcal, total fat 0g (saturated fat 0g), total carbohydrate 66.7g (sugar 33.3g), protein 0g, salt 28.3g.